Chinese smartphone maker company Xiaomi, launched the Xiaomi Mi 3, its first Smartphone in India. It has listed for sale online at Rs 13,999 in Indian market. Xiaomi Mi 3 runs on 4.3 Android Jelly Bean, upgradable to KitKat 4.4.2. Xiaomi Mi 3 powered by Quad–core 2.3GHz Krait 400 processor and 2 GB RAM and 16GB Rom. Xiaomi Mi 3is a Smartphone which is available in dual SIM with 3G facility with metallic gray Color. This Smartphone uses different chipsets for different variants in 3G versions with 2.3 GHz quad core Qualcomm Snapdragon 800 8274AB processors. It has 13 MP (4128 x 3096 pixels) with autofocus, dual-LED flash facility on rear and 2.0 MP front camera. Xiaomi Mi 3 Powered by 2.3 GHz Quad-core Krait 400 processor With Adreno 330 GPU. Xiaomi Mi 3 has Qualcomm MSM8274AB Snapdragon 800 Chipset. Xiaomi Mi 3 has 2GB RAM With 16GB ROM and user can’t be expanded Memory. Xiaomi Mi 3 comes with IPS LCD 5.0-inch capacitive touchscreen with resolution 1080 x 1920 pixels. Xiaomi Mi 3 has 13 MP Rear Camera with 4128 x 3096 pixels Geo-tagging, touch focus, face and smile detection, HDR autofocus and dual-LED flash with 2MP front Camera. 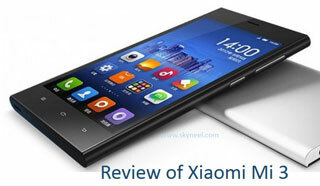 Xiaomi Mi 3 is a stylish phone, it has 144 x 73.6 x 8.1 mm Dimension and this phone weight is 145g. Xiaomi Mi 3 runs Android 4.4.2 Android (KitKat). The Smartphone has a compass, Accelerometer, proximity and Maps, Calendar, Google Search, Gmail, YouTube, Google Talk, Alarm, Calculator, Clock, and other Google sync apps. Xiaomi Mi 3 supports 3G(WCDMA) and 2G(GSM) networks. It has EDGE/GPRS/DC-HSPA+(42Mbps), Wi-Fi Display,Wi-Fi Direct，5GHz Wi-Fi, GPS + GLONASS, AGPS and Bluetooth® 4.0, Bluetooth HID with 3050mAh lithium-ion battery. 1. It has Faster CPU (2.3 GHz) and 2GB RAM. 3. It has Accelerometer, gyro, Compass, barometer and proximity Sensors. 4. It has High Screen Resolution with Full HD. 5. It has Lots Of Storage Capacity 16GB. 1. It doesn’t Have Memory Card Support. 2. It Can’t Output To TV. 3. It has Non-Removable Battery.